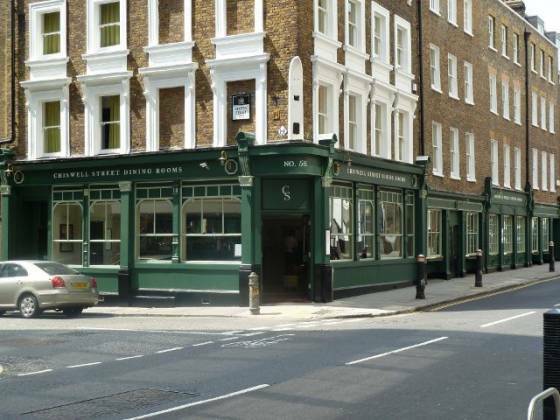 Chiswell Street Dining Rooms is a newly opened restaurant near Barbican, Islington. 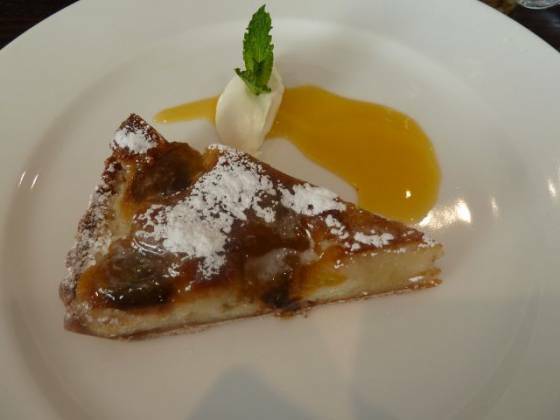 I was looking at exploring one of their other venues Sunday roast (The Prince Arthur), when I was invited to visit Chiswell Street Dining Rooms for their launch party. Unfortunately, we were unable to attend but that didn’t stop us making a reservation for Sunday lunch! I received a call on Sunday morning to make sure we still wanted the table, which is always a nice touch (in my opinion). Claire and I arrived just before 1pm, and were greeted as soon as we walked through the door. “Would we like to take our table, or have a drink first?” As we were meeting Rona and Craig (Claire’s sister and her boyfriend), we decided to have a drink first. Looking over the drinks menu, I was staggered at the amount of options available. I am a non-drinker, and enjoy my herbal teas so I was very pleased to see a great selection such as Gunpowder Mint Tea and Whole Flower Chamomile. I really wanted the “Flowering Tea”, but seeing as I was in public, I chose the (slightly) more manly Mango Green Tea. Claire settled on the English Sparkling Wine (from Kent). Yes, they were more expensive than a pub (£3.10 and £6.50 respectively), but seeing as we were in Central London I feel they were quite reasonably priced. Rona & Craig arrived shortly after our drinks were served. Rona decided to go for a Rose Bud Tea, Craig went for the Berry Smoothie. Presentation-wise, the tea’s came out in their own glass infuser which made them look very special. After relaxing for a couple of minutes, we decided to move to the restaurant area. We were shown to our table and given menus. We were asked if table water was required, Claire and I requested sparkling, Rona and Craig wanted non. 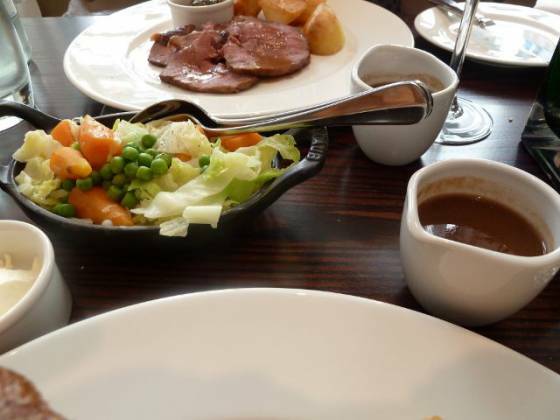 The food choices were good, with 2 types of roast – Roast Rib of Aberdeen Angus Beef or Roast West Devon Lamb. Rona, Craig and myself went for the roast beef, and as we have to at least try to sample all the roast options, Claire decided on the roast lamb. We were each asked how we would like our meat cooked – medium-rare or well-done. Claire and Rona both chose well-done, me and Craig being full-on carnivores chose medium-rare. Looking around, the cream and white walls with wooden floors and magnificent flower arrangements (lilies) meant the whole restaurant and bar area feel very fresh. I did need to use the gents and was shocked at how nice it was! There was an orchid in the men’s, and taps were crystal encrusted! I understand the ladies was up to a similar standard. Chiswell Street Dining Rooms really show that they care about all the fine details. Our food came out after around 10-15 minutes, enough time for me to sample the very nice bread that was served whilst waiting. We knew this was going to be special. The meat and potatoes were served first with, very unusually, individual side dishes of vegetables coming out next and a small jug of gravy each. We all had around 3 thin slices of meat, approximately 4 small roast potatoes, peas, carrots and cabbage. The roast beef eaters had a yorkshire pudding each as well as a pot of horseradish cream. 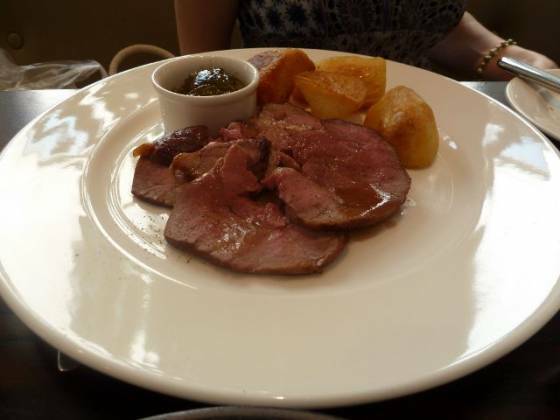 Claire’s roast lamb didn’t have the yorkshire pudding, but had a pot of mint jelly instead. So, tucking into the food, there was not a lot of talking going on! We all agreed that the meat was cooked perfectly to our tastes, delicate and easy to cut with a normal knife. The potatoes were excellent, very crunchy on the outside, with a fluffy texture middle (it is advertised on the menu that they are cooked in goose fat). The vegetables were also very good, tasting fresh and cooked well. The beef eaters felt the yorkshires were very much up to scratch, Rona and Craig also really liked the horseradish cream (I did try it, but am not a fan of horseradish so appreciated it was in a pot instead of over the food); Claire loved the mint sauce with the lamb. The gravy was nice, definitely a good touch having the individual portion, just a shame it was only a small pot worth (we all like smothering our roasts with it). 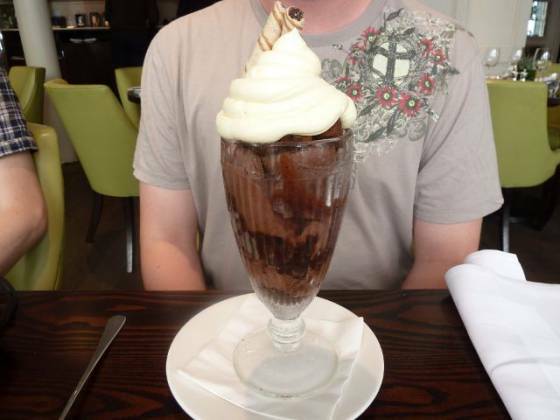 After such a splendid Sunday lunch, we just had to try out the puddings! A great selection available, with some old fashioned favourites. 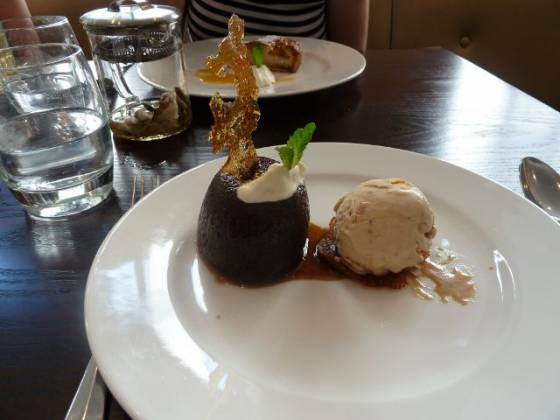 Rona went for one of the specials (“Plum & Almond Tart”), Craig decided on the Sticky Toffee Pudding and I settled on the Chocolate Sundae. Claire was being good, as usual, and decided to sit back and watch us gorge ourselves. So, a conclusion. 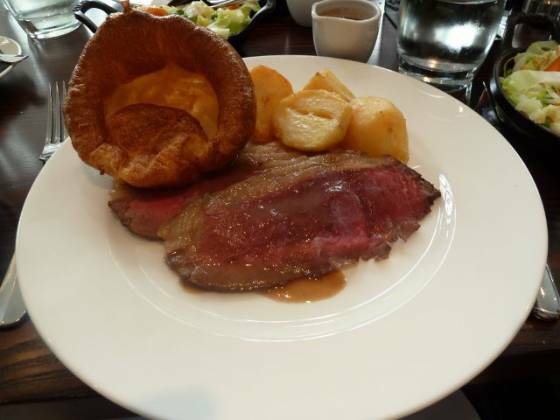 Chiswell Street Dining Rooms has to be one of the best Sunday Lunch experiences we have had, ever. Yes, the food price is near the top-end of what i would like to pay, being £16.50 for a roast, but being Central London I actually feel this is extremely reasonable. The staff were attentive, it actually seemed that each one in turn said goodbye to us as we left. The venue is fresh, light and airy with lots of little touches. The food quality and presentation was top-notch, and the desserts were definitely something to write home about. It’s not suited to young families, far too fancy for that. Instead, this is a place to bring people for a very special lunch.